The legendary house in which Trout Mask Replica was endlessly rehearsed is up for sale. For $849,900 you can own and (hopefully) preserve a property of considerable historical importance to all Beefheart fans. This is the house where a poverty stricken Magic Band were kept under virtual house arrest while honing the impossibly intricate album Trout Mask Replica, and subjected to virtual brain washing sessions to “help” coax the unique music out of them. The music was written here; painstakingly transcribed by John French, taught to the band and many tracks on Trout Mask were even recorded here – Dust Blows Forward, Hair Pie Bake 1, China Pig, Well and Orange Claw Hammer along with much of the dialogue snippets (“No, it’s Hair Pie” etc). All of the Trout Mask Sessions section of Grow Fins was recorded here. This was Don and Jan’s first home together, where they lived before and after their wedding. The “enchanted garden” photos from the cover of Trout Mask Replica and Grow Fins were taken here – the bridge under which John French was hiding was out the back of the property, bits of which still remain according to French. The eucalyptus trees which Don was so concerned about hurting with his music lived here (no longer, sadly) resulting in him billing Frank Zappa for a tree surgeon to tend to them. Ok, ok this is taking trivia to it’s trivial limits, but anyone even slightly familiar with Beefheart lore will know the stories which took place at this location. Quite apart from any of this it’s a strikingly beautiful and downright odd looking house; it’s not just that it’s pink, it looks every bit as strange and wild as the band itself in every way. See the agents’ listing for more information – it even mentions Beefheart as a selling point! If you know any wealthy Beefheart fans who might be interested in preserving this property then please give them a nudge in the right direction. 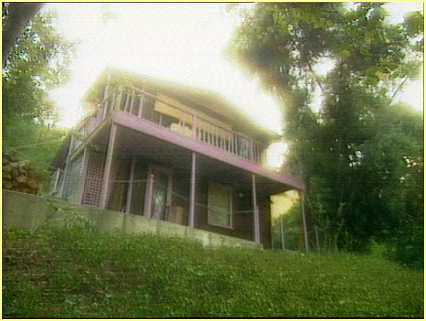 See stills of the house taken from the Artist Formerly Known As Captain Beefheart documentary, some photos taken by Angel when she made a pilgrimage to the Woodland Hills house, and John French’s comments about the house. If only I had £400,000 lying around! I really hope it’s bought and preserved, rather than bought just for the land it sits on. Can we not just get 800 Beefheart fans to put in £50 each?!??! Maybe it should be turned into a museum in honour of Captain Beefheart & his Magic Bands! And Jack, if you find 788 other people, I’m in for the £50. Nice idea, Jack, but you’re out by a factor of 10. However, if there are 10,000 Fall fans out there, then there must be 8,000 Beefheart fans. We should sell options – or set up a binding online petition, or something. Something must be done. Where’s Matt Groening when you need him? I’m in for £50. Oops! Indeed, 8000! I don’t know if my finger slipped on the 0 key, or I am just terrible at maths! But yeah, Groening should be informed of this, he may save the day! though, i bet ALL the neighboring houses have been built in the past fifteen years, based on seeing them when driving the road. the dark hills would be more fun (and spooky) to drive thirty years ago, i’m sure. I really want to buy that house. Then I’d be rehearsing my band in there for countless hours. And eating from In-N-Out instead of beans.